The hard-working folks at the Oregon Food Bank wanted to move on and direct all their attention to what they do every day — fight hunger. 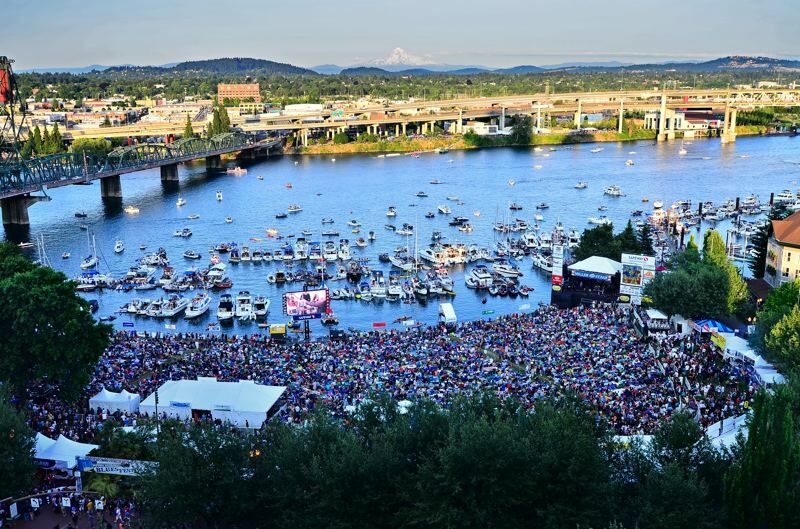 So last week the organization bowed out after 30 years as owner and operator of the Waterfront Blues Festival, although the food bank will stay on as beneficary of the popular event that draws tens of thousands to Waterfront Park in early July. No worries: The Waterfront Blues Festival will be as well-run as ever. Waterfront Blues Production and Fuller Events have assumed all oversight and management of the festival, and the people have much experience, including longtime festival director Peter Dammann. "The messaging will remain largely the same; the food bank logos will be there. The event is still alive with the hunger mission. A lot of food bank people will be working with us on-site," Dammann says. "The whole point was to take the load off their staff as far as the nuts and bolts of the festival." Dammann, who often plays with bands during the festival, and Clay Fuller are partners with Waterfront Blues Production, which handles infrastructure, permits, contracts, stage crews, etc. Fuller's son, Tyler Fuller, and his wife, Christina, run Fuller Events, which does site production and infrastructure for big downtown events — the Rose Festival, The Bite, Gay Pride Parade, TedX, Feast Portland, Cinco de Mayo. "Clay Fuller founded the festival back in 1988 and turned it over to the food bank," Dammann says. "His model was to have a social service agency run the show and be the public face of the event." He adds: "There aren't any new faces coming in." The Oregon Food Bank set up the volunteers, but "it's not rocket science, we're going to figure that out," Dammann says. About 90,000 music fans attend the blues festival, which takes place July 4-7 this year. Entercom, whose empire includes KGON and KNRK, have partnered as radio sponsor. A new website and some lineup announcements will be rolled out in mid-February. The festival has gone to full paid admission of $10 per day (with four-day passes available), rather than a suggested $10 donation. The change came about some years ago when the Steve Miller Band played, and research found that only about 40 percent of fans donated money at the gate. Meanwhile, thousands of Steve Miller fans who willingly would have paid stood outside of the sold-out event. The festival started to charge for one-day tickets, before going to the flat $10 per day for each day last year. "It wasn't driven as much by needing to get $10 out of everybody, but to get a handle on the crowd and how it came in and left the park," Dammann says. "We saw a slight dip in the numbers of people who came into the park by putting a $10 charge on, but it made for a much more user-friendly experience in the park — beer lines were not out of control, traffic was flowing but it was still pretty packed. It was a more relaxed scene. "Some people objected to paying $10 to come to the park, but most people realized to see somebody like Chris Isaak for $10 was OK."
This will be Dammann's 25th year involved with the festival. He has played with the likes of Paul deLay, Linda Hornbuckle and D.K. Stewart, as well as national acts Hubert Sumlin and Pinetop Perkins. "The weeks leading up the festival I'm buried in the minutiae," he says. "'Is the bass player a vegetarian? When does the flight arrive from Austin? They have three horn players and need three more.' That kind of stuff consumes my life for two months. Once I get the park, my spreadsheet explodes and (the festival) turns into this unbelievably cool critter. It's exhilarating."